Directed by Shruti Sharma, 'Aladdin' starring Taaruk Raina, Kira, Mantra and many others, is a presentation worth experiencing, for it takes you on a nostalgic ride thereby leaving an impression in your heart much deeper than that of the original. Change is the only constant - this statement, as cliché as it gets, stands true. This time, my reference to such a thought is with regards to 'Disney's Aladdin' — A Broadway-style musical produced by BookMyShow. The romance between Aladdin and Jasmine is one of the first few love stories we came across as children, and the genie is one of the few characters we wished to have in real life, as a companion, for all our good and bad days. The nostalgia that lingers along with such stories can seldom be replaced by recreations or alternative representations and if attempted, have to successfully impress and win hearts of every member in the audience, just like the original. Striving to do the same, but with a promise of taking one on a magical experience is Disney's Aladdin. Curtains rise, and there begins a show with Mantra’s welcome in the ever-so-famous Aladdin theme song, seamlessly takes you to the city of Agrabah and where our titular hero, Aladdin and his friends spend time happily. On the other hand, the gorgeous princess Jasmine is facing a tough time in the palace where the Sultan wants to get married to someone of the same stature, so as to continue the tradition to be the next in throne. To avoid the same, she runs away for a day to a market in Agrabah, where she meets Aladdin. In no time, conversation leads to attraction, and a new emotion is born. This irks Jaffar, who wants to marry Jasmine, with an aim, only to be the next Sultan. He refers to the book of fortune, which guides him towards a cave, to possess a magical lamp. He tricks Aladdin and seeks his help to get that from the cave, as guided. But destiny has it, and Aladdin, due to an unfortunate incident, rubs the lamp and there comes genie out of the lamp. They become friends, and as part of his duty, he offers 3 wishes to his master, which can be granted if commanded. Here begins the journey of friendship and love, which makes the rest of the play, Aladdin! As children, we would have come across the characters in an animated form, and to see them now, being performed in real and in person, brings in a lot of excitement to everyone in the audience, despite the age. As the story translates from one scene to another, it is evident that besides hard work, a lot of passion and love has gone into making this Broadway-style musical. Every element on the stage is made with perfection and keen attention to detail, to ensure that the audience stays glued to the story and leaves with an unforgettable experience. The performers play a key role in this production. Casting by Tess Joseph couldn’t get better. Taaruk Raina as Aladdin is adorable. He skillfully performs the role with energy and ease. Kira as Jasmine looks and sounds beautiful. She is blessed with a voice which can grab your attention immediately. She sings her part with utmost comfort. I was thoroughly impressed by Vikrant Chaturvedi’s character as Jafar and Dhruv Lohumi's character as Iago. The duo shares an impressive chemistry. Vikrant’s experience in theatre shines through the musical, and Dhruv supports him to perfection. Deven Khote’s role as Sultan will make you smile. 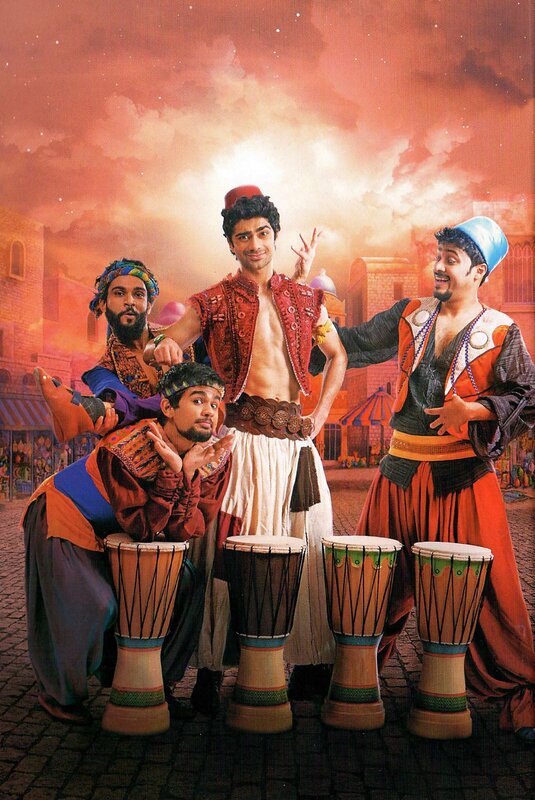 Though he has his role in parts, Sultan has a significant character in the musical. His performance in one of the songs with the residents of Agrabah is worth watching. He is too sweet. All the actors perfectly fit the character, and each one of them has a distinctive role to play. Every role written here has its own abilities, enacted to the best. But if there is one character which brought a different energy to the show and that is Genie — played by Mantra. Popularly known for his linguistic skills, Mantra’s personification of the ever-so-famous genie wins you over, the moment he comes out of the magical lamp. His command over the language and art is praise-worthy, and he maintains the decorum and the chemistry until the end. What surprised me the most in this musical was the story - although we all know - has been presented with a new taste. The script and the story, while being true to the original, also includes some tickling moments here and there to the current affairs. Smart execution with dialogues focusing on pun and political satire, ensure that the lines have been penned with care, to grab attention in a visually enriching musical. Writer Ravindra Acharya and lyricist Anvita Dutt’s efforts to involve the ‘desi-ness’ adds a lot of value to the play. The conversations are simple, sweet, yet strong. Dhruv Ghanekar’s score and music is soothing and apt. The skilled, ace musician has given the musical a mix of all genres, which enhances the experience. The set and production design is larger than life. Installations and scenic designs by Varsha, animation by Abhishek Sawant and lighting by Roosevelt D’souza will have you spellbound. The trio has created many "wow" moments in the show. In the first half, the audience was awestruck at a moment, where one can see nothing but illuminated creatures in the dark. And then there was the flying carpet. Imagine visualising that over a bed of clouds. Bringing that memory alive, was a task well performed by the team. There is a smile throughout when Aladdin and Jasmine express love in the air on that well executed ‘magical’ act. To sum up my experience, BookMyShow and Disney's musical 'Aladdin' is a once in a lifetime experience. Broadway-style musicals are new to the country, and such productions only make the belief concrete that this new form of entertainment is heading in the right direction. Experiencing and encouraging such efforts is key, as the team deserves a ton of appreciation to put up a show, which will be etched in the memory, for a lifetime. I could go on and on expressing my views like a child, but it would only be fair if you experience this magic in real.